IDW Publishing is pleased to announce the return of its preeminent horror series, 30 DAYS OF NIGHT. Originally created by Steve Niles and Ben Templesmith, 30 DAYS OF NIGHT has spawned two feature films and countless nightmares since it first launched in 2002. Now, award-winning horror writer Joe R. Lansdale and legendary artist Sam Kieth (Sandman) take the helm with an all-new series 30 DAYS OF NIGHT: NIGHT, AGAIN. 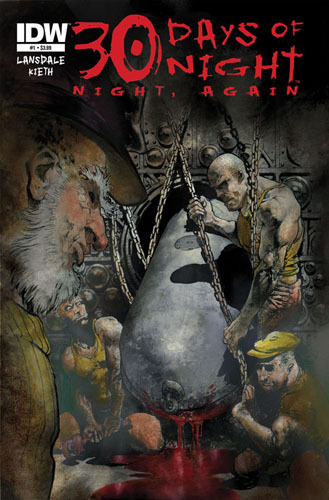 30 DAYS OF NIGHT: NIGHT AGAIN #1 ($3.99, 32 pages, full color) will be available in stores in May. Diamond order code MAR11 0447.